"Azimuth" is a powerful debut of a new jazz improv trio. Hailing from Chicago, which is seemingly bottomless in the area's ability to produce quality jazz musicians, the album is a live concert from 2014 at the Constellation. The trio is comprised of: Ingebrigt Haker-Flaten (bass), Avreeayl Ra (drums), and Nick Mazzarella (saxophone). Haker-Flaten is certainly the most recognizable name, from working in a myriad of groups like the Thing and Atomic. Avreeayl Ra, a member of the AACM, is a well known local musician who has worked with the giants of Chicago improvised music, from Fred Anderson to Sun Ra. Nick Mazzarella, by comparison, is lesser known, but has been steadily working for two decades in the Chicago scene, with diverse interests. He plays in the alternative rock band the Eternals; is a collaborator in many groups, from Rob Mazurek to Frank Rosaly, as well as leader of several different groups, ranging from duos, to quintets; and is a concert promoter of the local music scene. "Azimuth" combines the three's diverse talents, and is a tight lipped, muscular effort that combines heavy physicality with spirituality. The opening track, "Vega," starts off strong, with Mazzarella opening with a brief meditative solo, then joined by Haker-Flaten and Ra as they push Mazzarella with a rumbling, propulsive bass and percussion. Mazzarella has a wonderful tone, not sharp, but well rounded, and not deep, but full bodied and confident. 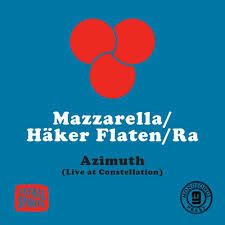 For thirty minutes Mazzarella glides, darts, and dives into and over Haker-Flaten's pounding bass and Ra's crushing percussion with skill. Yet over halfway through the track, one gets a sense that his creative expressive skills are limited. While the others can dig and push and improvise for as long as they feel like, without sounding tired, Mazzarella seems to run out of creative energy. It feels like he eventually plays to fill space, or loses direction with how he is expressing himself. The Thirty minutes may have been too ambitious. "Rigel" has Avreeayl Ra start off with exotic, liquid percussion (there is some water being moved around), then joined by Mazzarella, with high register notes that are fluid and fast. The two move at a breathtakingly fast pace, and Mazzarella shines with his rapid fire and ability to express. But the conclusion to the track is awkwardly abrupt -- stopping as if that was just enough, but doing so in the middle of a thought that becomes incomplete. "Spica," the final track, is easily the best track of the lot, a deeply moving tune that recalls the best spiritual free jazz music from the 60s and 70s. Mazzarella plays it like an uplifting ballad, while Haker-Flaten and Ra create contrast with a dark menacing foundation of rumbling bass and bass percussion. The music builds to a powerful cresendo, and gently concludes with the trio in rhythmic unison. Having reviewed many albums, "Azimuth" is a frustrating listen for me. There are so many positives -- the high quality of musicianship, the interaction and expression of the music. But there is something lacking. Is it Mazzarella with his limitations? Is the creativity as strong as it should be -- there are many moments in the album where explosive creativity is followed by tenuous uncertainty. And above all there is a lack of deep down rootsy soul that is necessary in this music. "Azimuth" is a promising debut, and should be heard, but with caveats. This is one of the the surprises of this year's fall (apart from Jeff Henderson's "The Voice of an Angle"). Mazzarella's trio with Anton Hatwich and Frank Rosaly is also worth checking out. I like especially his rich and full tone, which often reminds of Coltrane and Sanders (and you have to keep in mind that he is only 31 years old). One of the musicians we will have to watch in the next years.